"When a talented, veteran broadcaster like Terry McGovern tracks for your radio station, your listeners like what they hear." 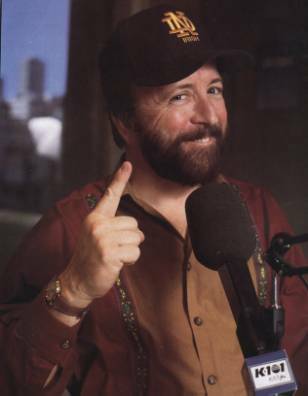 It was radio station KSFO that brought Terry to San Francisco . He had just finished five years at the nation's pioneer radio station, KDKA, Pittsburgh, and arrived in the Bay Area at age 25. After a few years at the area's number one personality/music station, he made the move to "underground" FM, where he re-invented morning radio with his four year stint at the country's original progressive, free-form stations, KSAN - the Jive Ninety-Five. Leaving broadcasting in the late seventies to pursue his acting career, Terry returned to this field in 1988 when he moved back to the Bay Area. He was morning man on K-101 and KYA-FM. Terry can provide air check samples on request and is available to track shows from his studio and supply them to local stations anywhere by MP3, overnight CD or live transmission via Telos Zephyr. He was on the staff of the nation's first television magazine, Evening, for Westinghouse Broadcasting. Terry has livened up broadcast remotes for KTVU's Mornings On 2 and as the anchor for Bay-TV Morning. During this time, he produced hundreds of video packages on subjects ranging from acupuncture to zero-based budgeting. Now, with over twenty-five years of on-air experience, Terry McGovern can add a solid, professional sound to your radio station or provide your television show with its own San Francisco reporter. For more information and a sample air check, email or call toll-free 1-866-29-ACTOR. BAY-TV, San Francisco, 1994 - Present, voice of station.